A concern with the “everyday” happens to coincide for two of Beijing’s experimental spaces: both Vitamin Creative Space (whose Pavilion I addressed previously on ArtSlant (here) and HomeShop see it as grist to their mills. This past December, HomeShop moved into their new premises in a former Danwei dormitory in central Beijing. This move took place amidst an ongoing self-analysis of the relationship of their activities with the everyday and the sustainability of their practice. HomeShop thrives off its central, backstreet location. A look at Beijing’s unique structure reveals residential areas still existent very much in the centre of the city. Zoning of dedicated areas for residential, industrial or shopping is not so pronounced and there are still large areas of residential housing permeating the whole of Beijing’s structure, right to the centre. In the older areas within the 2nd Ring Road this takes the form of blocks of low-rise apartment blocks or the old-fashioned (although not necessarily very old) hutong alleyways. HomeShop began life in 2008 when artist Elaine W. Ho rented a storefront space near the Drum and Bell Towers. Over its two years of existence, this tiny space—a bedroom, bathroom and a semi-public living/working space opening directly onto the street—hosted a series of events organized by a floating community of artists under the HomeShop platform. Working within a series of broad themes, they reflected on the features and limitations of the physical spaces HomeShop inhabited. The new space “broadens our scope in number and potential” says Fotini Lazaridou-Hatzigoga, one of the primary collaborators. Physically, the new space is about ten times the area of the first HomeShop and comprises a series of rooms built around three-sides of a small internal courtyard, including a storefront activity space, individual studios and co-working space. A shared kitchen and dining area serve to encourage the communal aspect of the space. The storefront space is the physical feature that remains constant between the old and new spaces. 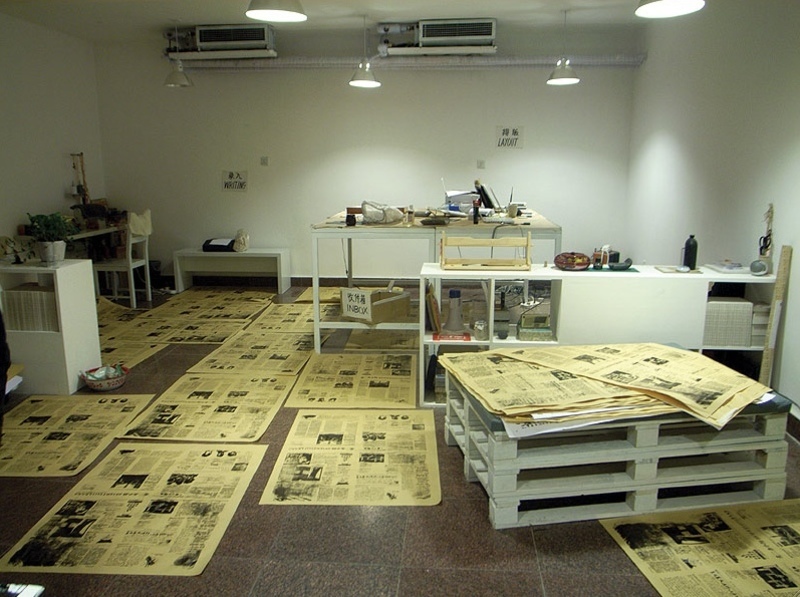 For the launch of the space in late December, this served as a communal area where a fast-turnaround, crowd-sourced newspaper was produced to celebrate (for which artist Michael Eddy created screen-printing facilities). But subtle and significant differences are evident which will push the group into new forms of working and interaction with their community. With a larger space comes a tendency towards institutionalization, which may go against the urge for flexibility and freedom which the original space embodied. This negotiation and productive relationship demands a light touch, in danger of dissipating if a heavy-handed approach were adopted, or rigid expectations of what might happen in a given situation were assumed. The beauty of the original space is that its front room was its world – there simply was no room (or desire) to shut oneself off and thus the activities were forced to spill out into the street and become communal. The artists would live and work in full view of the passers-by; encouraging interaction and unforeseen input into their own work and conversely into the neighbours’ lives. Any move creates new possibilities and potential, and HomeShop’s new space brings an inevitable change to the dynamic of its activities, as Elaine recognizes: “Admittedly there are a lot of pressures and changing dynamics to deal with for the new HomeShop, but all are measures in constant process, and we are trying to learn as we go.” HomeShop’s openness means this process will hopefully be self-evident and it will be instructive to see how the original HomeShop ethos is adapted to the new conditions.